Is The USS Alabama BB60 Haunted? 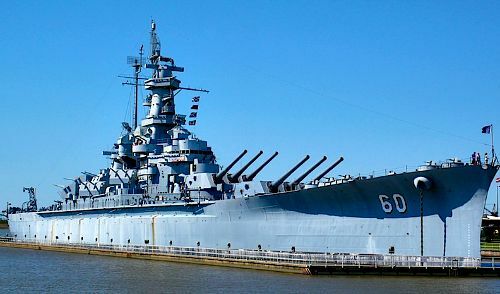 The USS Alabama BB60 was the 6th ship to be named after the state, with the BB60 being added to show the type of ship and to differentiate from the other Alabama named ships. It was construction began on the 1st of February 1940 and it took just 2 years to complete, with it being launched on the 16th of February 1942 and sent immediately to conduct training exercises. It was expected to see battle within a few months of its completion, with the secretary of the Navy at the time, Frank Knox making the following statement at the launching ceremony, "As Alabama slides down the ways today, she carries with her a great name and a great tradition. We cannot doubt that before many months have passed she will have had her first taste of battle. The Navy welcomes her as a new queen among her peers. In the future, as in the past, may the name Alabama ever stand for fighting spirit and devotion to a cause." The ship did see a good amount of action during the war, with it engaging in all kinds of battles, including fending off Japanese dive bombers and bombarding enemy positions across the whole pacific theatre. The ship lived a relatively short life, with it being decommissioned on 9th January 1947. Today it now sits in the battleship memorial park in Mobile, Alabama and has been open as a museum since 14th September 1964. The USS Alabama certainly has the background for a good haunting, with the first two deaths on the ship happening before construction was even finished. The two deaths were simply from accidents from the huge machines used to build the ship, but they were definetly not the last. The ship was built for the purpose of war and was sent into combat as soon as training was complete. There were a number of deaths during this time as the ship was responsible for firing tens of thousands of shells at the enemy, with them trying to do the same to the ship. Deaths from the enemy were lower than could be expected for such a sizable ship, which led to it being given the nickname "Lucky A". However luck would run our for some of the ships crew on the 21st of February 1943 when the ship was in combat with Japanese air forces. During the fighting, the ships 5 inch dual purpose gun number 9 accidently fired into gun mount number 5, killing 5 sailors instantly and wounding 11 others. The hauntings on the ship today are all thought to be from the sailors who died on it during the war. As you can guess one of the hotspots of the ship is the area around gun mount 5, where the 5 sailors died from friendly fire. People who have claimed to have witnessed activity in this area make claims of everything from the apparitions of mutilated sailors to simple sounds such as banging noises and whispers coming out of empty areas. Wet footprints have also been reported here more than once, with them appearing to have come from someone who just climbed onto the side of the ship from out the sea and walked part way across the deck, before ending suddenly. There are many more stories from this place, telling of everything from EVP to orbs and strange sights and sounds. Whether the ship is haunted or not is up to you to decide for yourself, but either way the stories do not seem to be ending anytime soon.